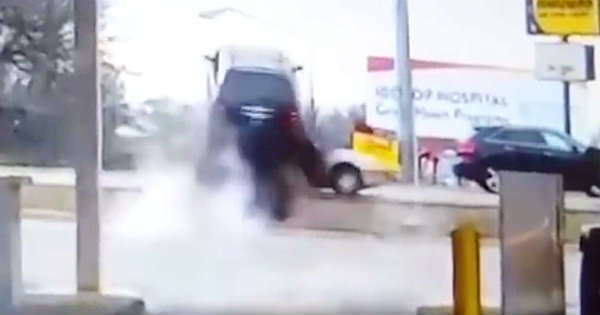 This Guy Had A Stuck Throttle & Sends His SUV Over Another Car! Many things are prior to going wrong whenever you are out there on the road in your vehicle and this is why we must always take good care of the situation, no matter how harmless it might seem. There have been many accidents in which the fault was not because of the driver; instead, their vehicles had some troubles. 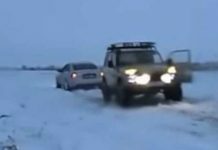 Most of you are familiar with those action scenes in which cars are launched over other cars, but what you are going to see here is a no movie. Namely, this is what can happen when you have a stuck throttle. Namely, we get the chance to take a look at this surveillance camera at a gas station and how did the whole situation take place. 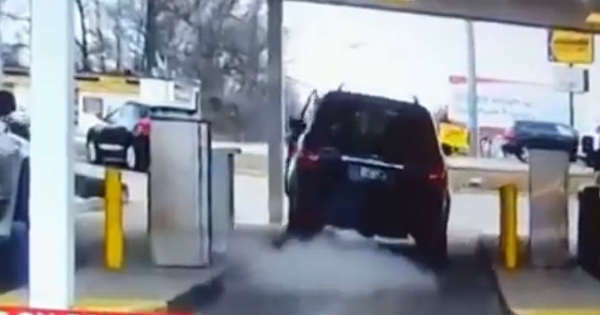 We can see a SUV parked by the gas pumps and the driver if fueling up his car. Pretty normally, when they were done they got inside the SUV and were ready to leave the gas station. However, this is where things went a bit wrong and a massive accident was caused by it. Just as the driver turned him key to start the car, something was utterly wrong with the car and caused it to start speeding immediately, thus ending up being launched into another vehicle on the road. The cause is most likely to have been a stuck throttle and even though the driver could have tried to do many things, nothing would have helped whatsoever. What an unrealistic sight! Previous article2018 VW UP GTI vs. 1976 VW Golf 1 GTI – Future vs. Past! Next articleThe Only Street Legal Aston Martin Vulcan Hits The Road! Another Reason Why You Should Love Manual Transmission Cars!